So not to come off like an azz on my first post, but why isn't the "how to do a self test" thread that I've seen referenced in about 100 posts while searching, a sticky at the top of the tech threads? Problem is a 94 bronco grounding out somewhere and draining the battery, tired of chasing the short, and I wanted to hook my AE to it see which component was throwing a code. Figured that'd make finding the short easier. But, it's a 94... So no dice... I don't have anything compatible. Looks like you got a good group of people here though, so somebody please post a link! Tech Bulletin #25: E4OD Electrical Problems That bulletin addresses an issue with short battery life, failure to display any codes and possibility of short solenoid pack life in your transmission. Run it around to heat the engine up and shift thru all gears incl Reverse. Then turn off all accessories/lights, etc. Make sure A/C is off and transmission is in Park (automatic) or in Neutral for a Manual & release clutch. Do Key On Engine Off (KOEO) portion first. Look Codes up in my broncolinks.com site using the new Search function. Last edited by Saltlife; 03-18-2014 at 05:13 PM. This is a cheap & easy upgrade to any EEC-IV vehicle: a simple jumper wire twisted into the harness behind the DLC makes pulling codes or triggering the fuel pump relay quick & convenient. Scratch the terminal identifications into the plastic connector shells. Scan Tool Won’t Initiate Self-Test Due to Poor Grounds, Corroded Wiring, etc. 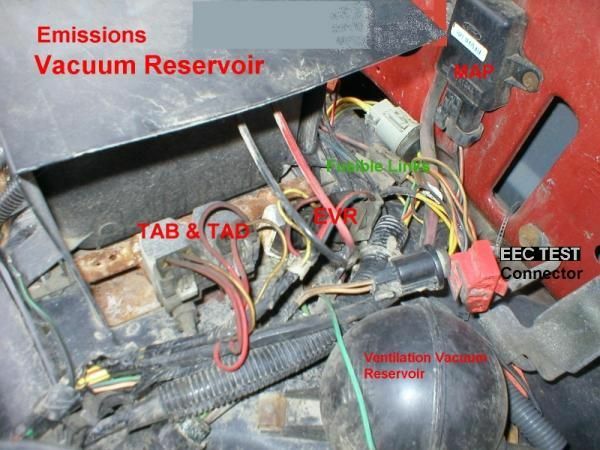 ; read more on how to Ground the STI & Proceed w/ Test; miesk5 Note; Steve83 advises; "...If the CEL is burned out, connect CEL © to a 12V test light, and the light's other terminal to a 12V source on the same vehicle..."
the EEC (computer) ground comes from two main sources, one is the body/frame ground (G104) and the other is the small black wire that goes directly to the negative terminal of the battery (G101/102). G104 goes to EEC Pin #20 and the TFI ICM. G101/102 goes to EEC Pin #40 & 60. 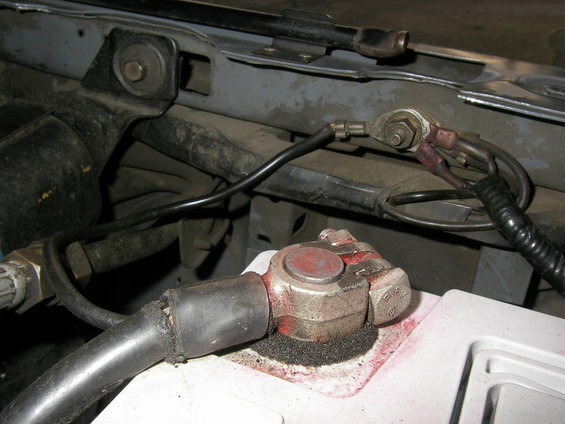 This a direct ground to the battery(-) post and the connection on the radiator support is frequently the cause of problems. It can also corrode developing a poor connection at the negative battery cable connection at the battery post. I lost ID of author. The transmission control switch wiring may be misrouted causing a short in the steering column and a blown # 17 fuse. The following symptoms may be associated with this concern. Inspect the transmission control switch wiring for damage and repair or replace as necessary. Refer to the following procedure for service details. 1. Remove the steering column cover. Refer to the 1992 Bronco/F-Series Service Manual, Section 11-04B, for the removal procedure. 3. Repair or replace the wiring as necessary. 4. Install the steering column cover. Refer to the 1992 Bronco/F-Series Service Manual, Section 11-04B, for the installation procedure. DURING REASSEMBLY, ROUTE WIRING AWAY FROM ATTACHING SCREW SO AS NOT TO PINCH OR DAMAGE WIRE. Since oldfuelinjection.com is down for the count. I wanted to update this thread with the self test pages from that site. I pulled them off the site (if owners want me to delete this I can). 10	X	Cylinder #1 Failed Cylinder Balance Test. 11	X	X	X	System pass! 12	X	Cannot control RPM during ER Self-Test high RPM check. 13	X	Cannot control RPM during ER Self-Test low RPM check. 14	X	Two or more successive erratic Profile Ignition Pickup (PIP) pulses occurred, resulting in a possible engine miss or stall. 15	X	EEC permanent Read Only Memory (ROM) test failed. X	EEC battery powered Keep Alive Memory (KAM) test failed. 16	X	IDM signal not received. X	RPM too low to perform HEGO test. 17	X	RPM below Self-Test limit with Idle Air Control off. 18	X	SPOUT circuit open or spark angle word failure. X	IDM circuit failure or SPOUT circuit grounded. 19	X	Failure in EEC internal voltage. X	Cylinder Identification CID circuit failure. X	RPM erratic, dropped too low during test. 20	X	Cylinder #2 Failed Cylinder Balance Test. 21	X	X	X	ECT out of self test range 0.3 to 3.7 volts. 22	X	X	X	MAP/BP sensor out of self test range. 23	X	X	Closed throttle TPS voltage higher or lower than expected. 24	X	X	X	ACT sensor out of self test range 0.3 to 3.7 volts. 25	X	Knock not sensed during dynamic test. 26	X	MAF sensor was greater than 0.7 volts with engine off. X	MAF sensor was not between 0.2 and 1.5 volts with engine running. X	X	TOT sensor out of self test range. 28	X	X	VAT sensor out of self test range. X	Loss of IDM, right side. 29	X	Insufficient input from vehicle speed sensor. 30	X	Cylinder #3 Failed Cylinder Balance Test. 31	X	X	PFE or EVP circuit below minimum voltage of 0.24 volts. X	PFE or EVP circuit has intermittently failed below minimum voltage of 0.24 volts. 32	X	X	EVP circuit below minimum voltage of 0.24 volts. X	EVP circuit has intermittently failed below minimum voltage of 0.24 volts. 33	X	X	EGR valve opening not detected. 34	X	X	PFE or EVP circuit above the closed limit of 0.67 volts. X	PFE or EVP circuit has intermittently failed above the closed limit of 0.67 volts. 35	X	X	PFE or EVP circuit above the maximum limit of 4.81 volts. X	PFE or EVP circuit has intermittently failed above the maximum limit of 4.81 volts. 39	X	AXOD converter bypass clutch not applying properly. 40	X	Cylinder #4 Failed Cylinder Balance Test. 41	X	HEGO sensor circuit indicates system lean (right side). X	No HEGO switching detected always lean (right side). 42	X	HEGO sensor circuit indicates system rich (right side). X	No HEGO switching detected always rich (right side). 43	X	HEGO lean at Full Throttle. 44	X	X	Thermactor Air Injection system inoperative (Right side). 45	X	DIS coil pack 3 circuit failure or coil 1 primary circuit failure. X	Thermactor secondary air is misdirected. 46	X	DIS coil pack 1 circuit failure or coil 2 primary circuit failure. X	Thermactor air not bypassed during self test. 47	X	4WD switch closed. X	Measured air flow too low at base idle. 48	X	Loss of IDM, left side. X	Measured air flow too high at base idle. 49	X	SPOUT signal default to 10� BTDC. X	1 – 2 shift error (E4OD). 50	X	Cylinder #5 Failed Cylinder Balance Test. 51	X	X	ECT sensor signal is greater than the Self-Test maximum of 4.6 volts. 52	X	X	X	Power steering pressure switch always open or closed. 53	X	TPS circuit above maximum 4.5 volts. X	TPS circuit has intermittently failed above maximum 4.5 volts. 54	X	X	ACT s 5c7 ensor signal is greater than the Self-Test maximum of 4.6 volts. 55	X	Keyed power input to processor is open. 56	X	X	MAF circuit above maximum voltage of 4.5volts. X	X	TOT sensor output is greater than Self-Test maximum value of 4.8 volts. 57	X	Octane adjust service pin in use / circuit grounded. X	AXOD Neutral pressure switch circuit failed open. 58	X	X	VAT indicated -40�F / circuit open. 59	X	X	Low speed fuel pump circuit failure. X	X	2 – 3 shift error (E4OD). 60	& fec nbsp;	X	Cylinder #6 Failed Cylinder Balance Test. 61	X	ECT sensor is less than the Self-Test minimum of 0.2 volts. X	ECT sensor has intermittently failed below 0.2 volts. 62	X	4/3 or 3/2 pressure switch circuit failed open. X	Converter clutch error (E4OD). 63	X	TPS circuit below minimum 0.6 volts. X	TPS circuit has intermittently failed below minimum 0.6 volts. 64	X	ACT sensor is less than the Self-Test minimum of 0.2 volts. X	ACT sensor has intermittently failed below 0.2 volts. 65	X	Overdrive OFF switch was not cycled during KOER test (user error). 66	X	MAF sensor went below 0.4 volts during the last 80 warm-up cycles. X	X	TOT sensor output was less than Self-Test minimum value of 0.15 volts. 67	X	X	Neutral safety circuit failure. X	A/C circuit was on during KOER Self-Test. 68	X	Transmission recently overheated, or TOT sensor intermittently failed below 0.2 volts. 69	X	3 – 4 shift error. 70	X	Cylinder #7 Failed Cylinder Balance Test. 71	X	Software re-initialization detected or Cluster ControlAssembly circuit failed. 72	X	Power interruption detected or Message Center Control Assembly circuit failed. X	Insufficient MAF/MAP change during Dynamic Response Test (user error). 73	X	TPS senor did not exceed 25% rotation during Dynamic Response Test (user error). 74	X	Brake On/Off switch not actuated during KOER test (user error). 75	X	Brake On/Off switch failure always ON. 76	X	Insufficient VAT change during Dynamic Response Test (user error). 77	X	System failed 16e2 to recognize brief WOT during Dynamic Response Test (user error). 79	X	A/C or defrost on during self test. 80	X	Cylinder #8 Failed Cylinder Balance Test. 81	X	Air management 2 circuit failure (AM2/TAD). X	MAP sensor vacuum was not greater than 2 in-Hg (7 kPa) during normal vehicle operation. 82	X	Air management 1 circuit failure (AM1/TAB) . 83	X	EGR Control solenoid circuit failure. X	High speed electro-drive fan circuit failure. X	X	Low speed fuel pump relay circuit open. 84	X	X	EGR Vacuum Solenoid circuit failure. 85	X	X	Canister Purge Solenoid circuit failure. 86	X	3 � 4 Shift solenoid circuit failure. X	Adaptive fuel limit reached. 87	X	Fuel pump primary circuit failure. When the FP relay was activated by the EEC, voltage was not detected on the control circuit. X	Voltage was not detected on Fuel Pump Monitor while the engine was running. 88	X	Electro-drive fan circuit failure. X	Loss of dual plug input control. 89	X	Converter clutch solenoid circuit failure. 90	X	All cylinders passed Cylinder Balance Test. 91	X	Shift solenoid 1 circuit failure (E4OD). X	No HEGO switching detected always lean (left side). X	HEGO sensor circuit indicates system lean (left side). 92	X	Shift solenoid 2 circuit failure (E4OD). X	No HEGO switching detected always rich (left side). X	HEGO sensor circuit indicates system rich (left side). 93	X	Coast clutch solenoid circuit failure (E4OD). 94	X	Converter clutch solenoid circuit failure (E4OD). X	Thermactor Air Injection system inoperative (left side). 95	X	X	Fuel pump secondary circuit failure. The EEC senses infinite resistance to ground from the fuel pump on the Fuel Pump Monitor circuit. 96	X	X	Fuel pump secondary circuit failure. The EEC did not sense battery voltage on the Fuel Pump Monitor circuit. 97	X	Overdrive cancel indicator light circuit failure (E4OD). 98	X	X	Electronic pressure control driver open in EEC (E4OD). 99	X	X	Electronic pressure control circuit failure (E4OD). X	EEC system hasn�t learned to control idle. 112	X	ACT sensor signal is less than the Self-Test minimum of 0.2 volts. 113	X	ACT sensor signal is greater than the Self-Test maximum of 4.6 volts. X	ACT circuit has intermittently failed above the maximum of 4.6 volts. 114	X	X	ACT out of self test range 0.3 to 3.7 volts. 116	X	X	ECT out of self test range 0.3 to 3.7 volts. 117	X	ECT sensor signal is less than the Self-Test minimum of 0.2 volts. X	ECT circuit has intermittently failed below minimum 0.2 volts. 118	X	ECT sensor signal is greater than the Self-Test maximum of 4.6 volts. X	ECT circuit has intermittently failed above the maximum of 4.6 volts. 121	X	X	Closed throttle TPS voltage higher or lower than expected. X	TP sensor was inconsistent with the MAF/MAP value in the last 80 drive cycles. 122	X	TPS circuit below minimum 0.6 volts. 123	X	TP circuit above maximum 4.5 volts. 124	X	TP sensor was higher than expected with the MAF/MAP value in the last 80 drive cycles. 125	X	TP sensor was lower than expected with the MAF/MAP value in the last 80 drive cycles. 126	X	X	X	MAP/BP sensor out of self test range 1.4 to 1.6 volts. 128	X	MAP sensor vacuum was not greater than 2 in-Hg (7 kPa) during normal vehicle operation. 129	X	Insufficient MAF/MAP change during Dynamic Response Test. 157	X	MAF sensor went below 0.4 volts during the last 80 warm-up cycles. 158	X	X	MAF sensor went above 4.5 volts during the last 80 warm-up cycles. 159	X	MAF signal was greater than 0.70 volt during KOEO. X	MAF signal was not between 0.20 and 1.50 volts during KOER. 167	X	TPS did not exceed 25% rotation during the Dynamic Response Test. Last edited by Saltlife; 11-02-2014 at 05:34 PM.